I’m stretching the reports, even after my decision to do one chapter per report. I think I’ll have to shorten it further until I feel I have enough written for a decent post. Icewind Dale is a combat heavy game, but other than that and the story, very little is happening. Ironically, this chapter wouldn’t fit into a single posting, even though it spanned weeks. Lower Dorn’s Deep started with slave pens “housing” a bunch of deep gnome slaves or svirfnerblin as they like to call themselves. The enemies were consisting mostly of weird warden creatures and salamanders of the regular kind (meaning fire). The warden apparently see hidden creatures, so instead of doing my usual exploration thing with Rax, I used Haste, Prayer and Bless liberally and basically brute-forced my way through. A peculiar thing was a small tower guarding the slave pens. At first, I thought there were traps around it, because something kept hitting me, but Rax couldn’t detect any traps. I found a slave girl who was bringing food to the gnomes and she gave the key to the tower, which made things more clear. There was a bunch of archers inside, so the damage I was taking was from them. It’s a fun twist on the usual trap mechanic and I don’t remember anything of the sort in Baldur’s Gate. Killing the archers was tough to, because they would focus on Aleen as soon as I entered the tower, but after a few tries, I managed to do it and got a bunch of Piercing Arrows for Robin as well as a Full Plate Mail + 1 for Lorelei. D&D veterans know the value of that armor. Some things in the game are drawn weirdly, appearing smaller than they actually are. In the northeast, there was a small gnome or halfling (hard to tell from my camera angle) who was talking about some secret society or something, thinking I was part of it. When I said I wasn’t, he disappeared and I got ambushed by about a dozen thieves. It wasn’t extremely difficult, but it was a lengthy battle, simply because they started running of. No treasure here – just a bunch of gold and useless items. Triggering this thief attack also created an interesting glitch. 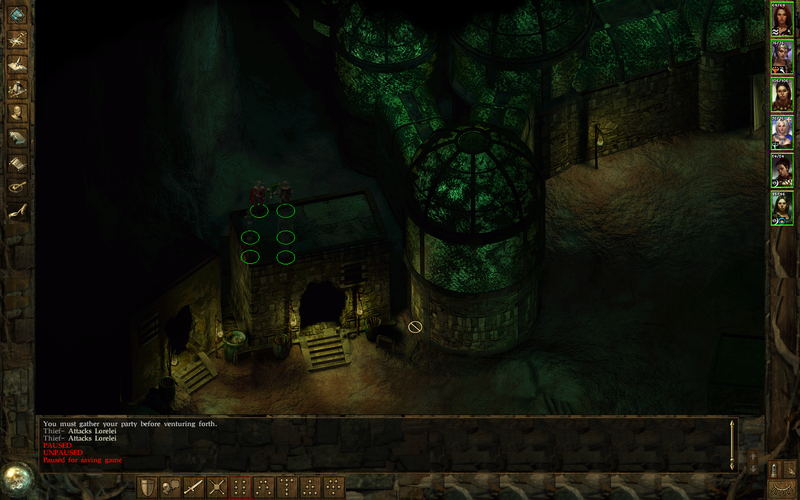 Four thieves spawned at a door to the northwest, with two of each spawning inside each other. They were unable to move and I wasn’t able to attack any of them in melee. I used Robin to kill one from range, which triggered the other one to start moving, but targeting that one with melee caused my party members to attack another one and ignore the one I was targeting. It was really strange. 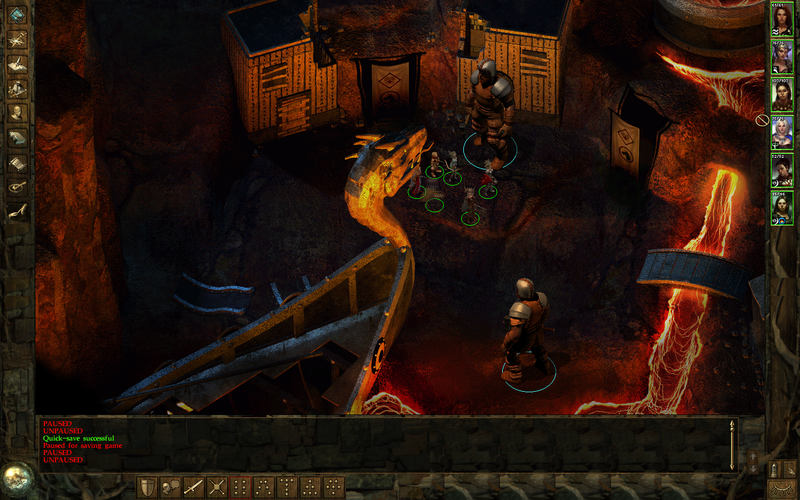 The four thieves guarded the way to the Artisan’s District, where I fought a bunch of minotaurs and umber hulks. An umber hulk’s gaze causes confusion, making them extremely annoying enemies to fight. I decided on not using haste here unless I really had to, since a confused paladin or fighter standing right next to a wizard is never a good thing. I don’t think anyone likes fighting umber hulks. This area was joined to two more areas. One was an inner sanctuary, where I fought a wizard named Malavon. He actually had two forms, the first of which was accompanied by several iron golems. Luckily, Lorelei had Conlan’s Hammer equipped, which provides a damage bonus against them. Even so, it took several attempts to win this fight. 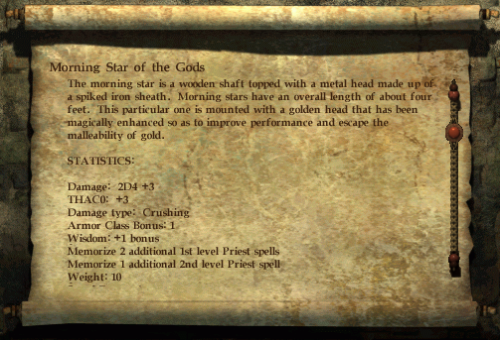 My reward was Malavon’s robe for Aleen, several other magical items and last but not least, a huge amount of high level spell scrolls. Aleen managed to write down all but one of them – Finger of Death failed. Malavon also dropped the second of the six badges, meaning I completely misunderstood the whole ordeal – the badges weren’t needed for the circular puzzle in the upper Dorn’s Deep. I was supposed to brute force it, maybe. At this point, I wasn’t able to explore one area after another anymore, as plenty of it included going back and forth. The underground park area was reachable through the other passage from the Artisan’s District. It was infected with fungus enemies and wrapped back around to the Slave Pens, through the main gate were I fought the large group of thieves. Since it was on the way, I went back and explored the part past the elevator first. On the way to the elevator, I realized there was another passage to a cave to the south. 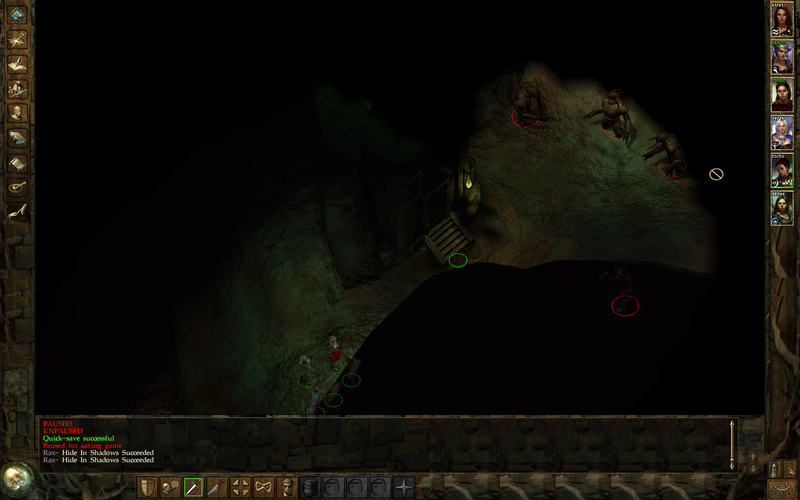 Down the elevator was another group of gnomes looking for food and being very thankful for my killing of Malavon. There was also a pair of rhino beetles accompanied by umber hulks. The beetles dropped their shells, so I picked two of them up, because the game describes them as very tough. 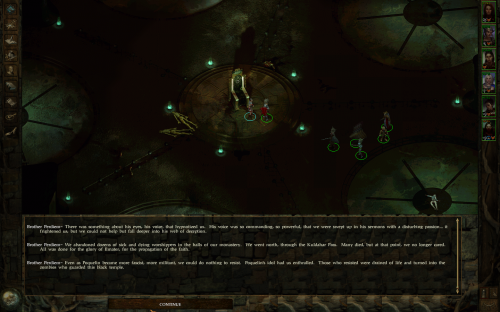 My experience with Baldur’s Gate told me there might be a way to turn them into armor. 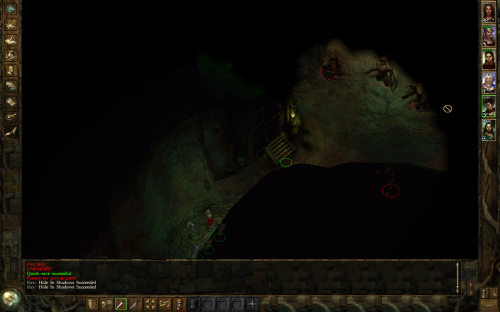 The lower cave had another group of salamander and a helpful deep gnome who told the salamander’s leader is also there. The funny thing? I killed the leader in the kerfuffle without even realizing it. He dropped a spear with a cool name – Slayer. Sadly, I don’t use spears. This is the first time I’ve seen fire giants in an infinity engine game, screenshots included. Further on, there was an area filled with lava and Fire Giants led by an elf woman named Maven. She was very talkative, but no matter which series of dialog choices I tried on her, she’d end up attacking and killing me in two hits. I tried various tactics to fight her, but she pulls all her fire giant friends into battle, so there was no way I was going to win. 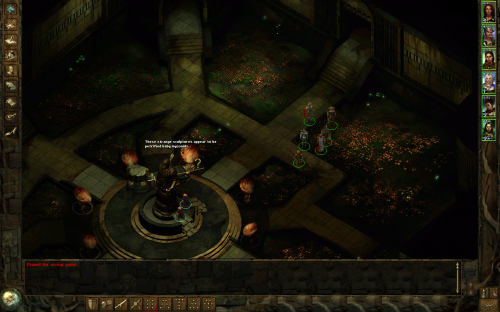 And then almost a month passed before I reloaded Icewind Dale. I mostly forgot what I was doing and only slowly started remembering as the game went along. I was in a sort of underground park with two gnome craftsmen near the central statue. They were carving a statue for Marketh, the holder of one of the six badges.. Clicking around also had me notice the small statues around the big one in the middle of the part are actually petrified baby myconids. It sounded like a plot point, but nothing ever came out of it. I figured I had the foresight, so I took the passage I was standing next to. To the north, I got into a battle with a bunch of higher level undead. It took me several tries and a lot of time, but I managed to clear it the usual way – Haste, Fireballs and lots of chanting. They were controlled by a bunch of crazed priests of Ilmater and were guarding an idol which I also had to kill. I found out the name of my opponent – Poquelin. Of course, I may have heard the name before or even written about it here, but as I said a lot of times, I’m horrible with names. I can’t wait for the bad guy to be named George for once. This priest area wrapped back around to the fire giant area, so I went back to the park and took another passage. That one led me to a nice place full of mostly neutral NPCs, all following Marketh. I say mostly neutral because one of them did attacked me and almost killed Priscilla. I managed to get rid of him and got a bunch of sweet items, including the Morning Star of the Gods for Alana. 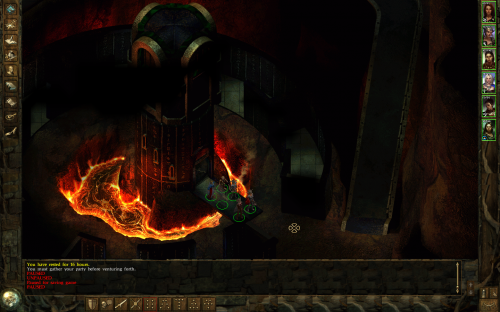 I’m beginning to think Icewind Dale goes a bit overboard with powering up. Everyone I talked to in this area basically asked me not to hurt their leader – that he’s actually a nice guy as long as Poquelin isn’t around, so I figured there’s a peaceful way to get Marketh’s badge. This ended up being easier than I thought – Marketh simply offered the badge in exchange for his life. The regular enemies here were thieves. Thieves are annoying, mostly because they hide in shadows until they’re ready to attack, so it’s tougher to scout. It also makes it very annoying to rest. You thin you succeeded and then you suddenly get back-stabbed. I went through my inventory and counted three out of six badges. I actually had five, but I missed one at this time. I decided to give the fire giant area another try and it ended up being the correct choice. I buffed up everyone, spoke to Ilmadia to trigger her attacking me and then immediately ganged up on her. She died before the fire giants turned hostile, so it might have been a buggy victory, but it was still a victory. I realized now that I had five badges and only needed one more. I also realized where I had to use them. There was a device/altar behind the idol in the undead area with six slots. There was only one left, so I looked through my journal to find anything I may have missed and I actually did. There was a deep gnome priest in the salamander area who I needed to talk to. There was a passage in the town area that led to a cave containing a corpse with a sword – Pale Justice. This is an amazing item, but I get the feeling it’s somehow plot related. Sadly, Priscilla has no sword proficiency. There was a deep gnome named Nori in a house in the initial area. He didn’t do much. He did make me regret not killing Marketh, though. Pale Justice can be found here. I couldn’t find the last key, so I did some scrying. I actually missed a badge and a frost giant in Wyrm’s Tooth. There was a broken bridge there which I noticed but never figured out or triggered the proper scripts to enable a quest. I had to get an engineering manual from one of the slaves and use it to repair it which led me to an area with frost giants. Luckily, the game designers did predict the possibility of missing it all, so the gnome slave drops the manual on the ground before leaving once the player frees them. 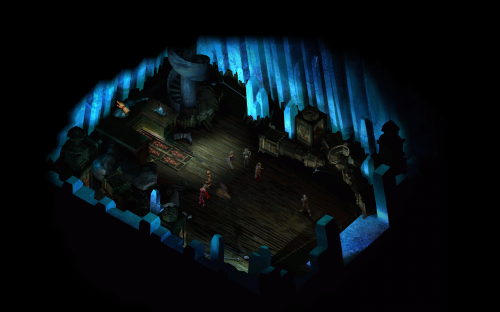 The ice cavern was split into separate smaller areas most of which I tore through with a hasted and blessed party. There were ice wolves, trolls and, naturally, frost giants. There was also a cave of frost wyrms related to a quest. 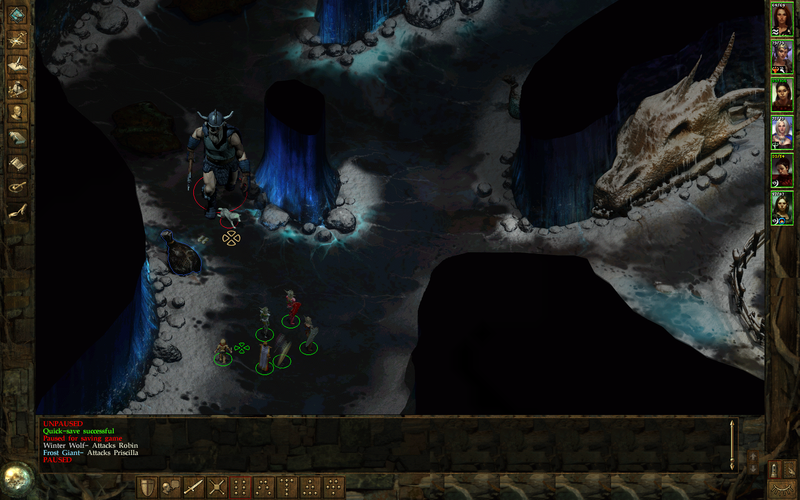 Frost giants were the most iconic monsters for me back when I only knew Icewind Dale from random screenshots in magazines. There was also a person named Kontik who was another worshiper of Auril, the Frost Maiden, just like the barmaid from Kuldahar. He or she (not sure) didn’t last long, but his or her black ice guards did. The frost giants themselves were relatively easy to get rid of and the quests involving them worth a lot of experience. I won’t even mention the quality of loot I’ve been getting. Instead, I think my next report will be about my party. In any case, I had all I needed, so it was time to face Poquelin. Poqeulin had that whole evil villain monologue thing figured out completely. Lucky for me, time pauses during conversations, so on my second attempt (of course I failed my first), I was able to beef up my guys before entering the fight. It took a suprisingly long amount of time for him to go down, and once he did, there was a slide show and there was no sound again. All I could hear was the buzzing of the Insect Swarm Alana cast from a scroll shortly before Poquelin died. On a side note, though the monologue was cliche, I have to admit, it tied the events leading up to all of this together very nicely. Once the fight and the mute slide show were both over, I was in an even more icy place, getting attacked by cyclops. I had to go to YouTube to watch the slide show and figure out what was going on. I was back in Easthaven. This is where the villains were going – the Easthaven temple. I got another overpowered weapon, which I can this time actually use and I cleared the ruined town of cyclops attacking them (cyclopses? cyclopsy?). Then I got to the third floor of the temple and tried to fight a former merchant now actually Poquelin’s loyal follower and bad guy. It was time for a break here. Next time, I’ll beat the bad guy and do a write-up on my party.